A pile cap is a thick concrete mat that rests on concrete or timber piles that have been driven into the soft or unstable soil to provide a suitable and stable foundation. The pile cap should be primarily designed considering the punching shear, for the punching shear around the heads of the piles and around the column base. Pile cap should also be designed for bending moment due to the transmission of loads from columns to the individual piles. 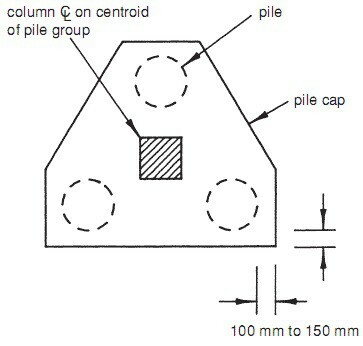 The shape and plan dimensions of the pile cap depend on two factors. 2. The spacing between each pile. Rectangular pile cap for all other no. of piles. 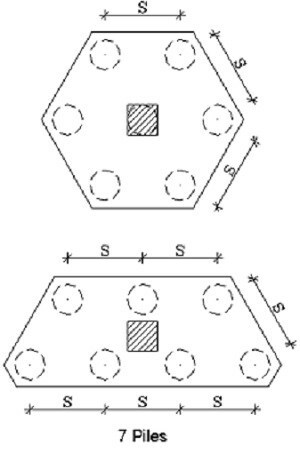 The shapes of the pile caps minimize the plan area for symmetrical pile arrangement about the load. The pile cap should overhand the outer piles by at least 150mm but should not be excessive, generally not more than the diameter of the pile diameter. The overall depth of the pile cap shall be such that it provides sufficient bond length for the pile reinforcement and the column reinforcement. The depth of the pile cap is decided by the following criteria. 3. Shrinkage and swelling of the soil. But from all the above criteria, the most important criteria is shear capacity of the pile (Beam and punching shear) which affect the selection of the pile depth. 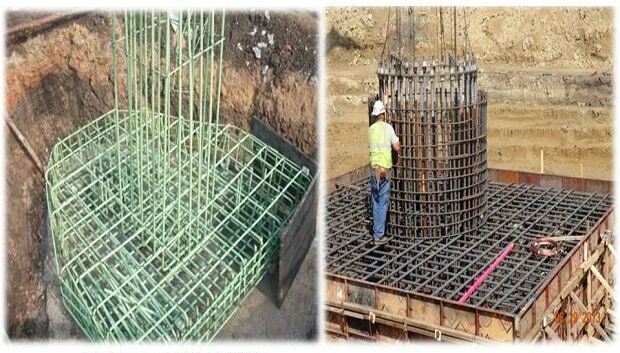 The secondary reinforcement is provided to prevent the piles from splaying outwards from the pile cap. 1. This reinforcement shall be provided at the bottom of the pile cap running around the longitudinal reinforcement projecting from the piles into the pile cap. 2. The direction of the secondary reinforcement should be changed at the head of each pile. The amount of secondary reinforcement changing its direction at the head of the each pile shall be not less than 20% of the main tensile reinforcement and should be well bonded. Also Read – One Way Slab reinforcement Details.